Summer usually means vacation time for school kids. But for young horses it’s often the season when they start school. Such is the case for Cowboy. He’s the palomino gelding that came to be when my mom and sister decided to breed the last of our family’s warmblood mares. 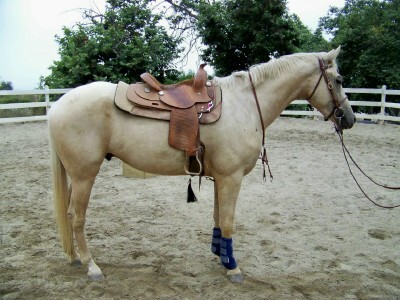 Cowboy was created with the idea that he’d turn out to be just a nice, general purpose riding horse. Both my sister and I figured he’d become the sort of creature that we could both ride, either English or western. However, with his elegant trot and flowing canter he seems better suited for someone hoping to compete in lower level dressage or hunters. Regardless of whether we keep him or sell him, the golden gelding must be trained, and neither my sister nor I have the time or motivation to put the first 20 rides on a 16-hand baby anymore. It’s a job best left to the professionals at this stage of our lives. Cowboy got a good start last summer. I did several months of ground-driving with him. Then a local western trainer introduced him to the feel of a rider on his back. Because he was still growing, we decided to give him more time to mature. We turned him out at home until he officially turned three. Then, a couple of weeks ago, we shipped him off to boarding school. It’s back to school for Cowboy, and here he is after just completing a workout in the round pen. Cowboy is spending the summer with Molly, a trainer I met who impressed me with the way she handles and starts fresh-off-the-range BLM mustangs. She uses good, solid horsemanship fundamentals; there’s no nonsense and no foo-foo fluff in her approach. Yet she’s also kind and forgiving with insecure greenies. Beyond that, she spent decades on the show circuit, producing several national champion Arabians. I figure that if you can communicate effectively with sensitive, hyper-intelligent Arabians without losing your cool, training a warmblood should be a piece of cake. Plus Molly’s got a wicked sense of humor, a bonus when you’re working with both horses and humans. Part of becoming a civilized horse, as far as I’m concerned, is learning to stand patiently in the cross-ties. Right now Molly is focusing on getting Cowboy to flex at the poll and yield or “give” to the bit. He’s also learning to move away from leg pressure. These are all major achievements, because without these skills the rider really has no way to communicate with the young horse. Of course we all need to take a shower after exercising, right? After a few more rides Cowboy should graduate from the round pen to the arena. That’s a major step, because the view from the arena is polka dotted with distractions. There’s always something going on, from feed trucks delivering hay to boarders saddling up their horses and lesson kids bobbing up and down at the posting trot. Add a small herd of barn cats to that and you have quite a combustible commotion on any given day. Yet all of this will make Cowboy more desensitized—and more broke—by the time he comes home at the end of summer. So much for a young horse’s vacation time! I’d ;ike nothing better than Cowboy making it big time!!! Loved the story. It’s been fun watching Cowboy grow up. He’s become a very handsome young horse. Oh, what a pretty young man!